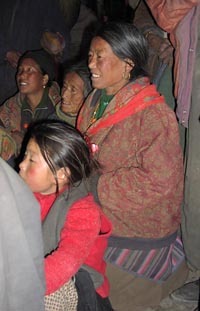 In December, 2002, Sara Shneiderman travelled to the village of Lubra in Mustang district of Nepal to show archival footage of the village taken by Christoph von Fürer-Haimendorf in 1962. The two photos below were taken at one of the numerous film viewings. Both photos taken by Sienna Craig © 2002.